28/01/2015 - The underlying strengths of the Estonian economy have helped it bounce back from the crisis, but some challenges remain to finding a steeper, more inclusive and more sustainable growth path, according to the latest OECD Economic Survey of Estonia 2017. 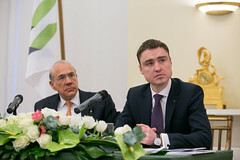 The Survey, presented in Tallinn by OECD Secretary-General Angel Gurría and Estonian Prime Minister Taavi Rõivas, notes that economic growth is accelerating, unemployment is falling and real GDP per capita may exceed the pre-crisis peak next year. The OECD identifies two broad avenues for future reforms - raising productivity growth and making the most of human capital. GDP per-hour worked in Estonia is less than half the average of the top half of the OECD, and this gap is closing only gradually. To accelerate productivity growth, Estonia should facilitate knowledge transfer across the economy, by strengthening collaboration between firms, applied research institutes and universities, both domestically and across borders. Eliminating remaining infrastructure gaps – notably by rapidly improving connectivity to Estonia’s European Union neighbours – and accelerating the insolvency process will help raise productivity. Energy efficiency programmes, including processing oil shale into lighter oil products, taxing the various energy sources according to their CO2 emission content and strengthening incentives to invest in the energy efficiency of buildings, can help reduce GHG emissions and energy consumption so that stronger growth doesn’t come at the cost of the environment, the Survey said. The Survey also focuses on actions that will allow Estonia to make more of its excellent human capital. Workplace-based education and training need to be strengthened. The OECD says Estonia should also create budgetary space to reduce the overall tax burden on labour, particularly for lower-paid workers, as well as to increase spending on education and training. The high fees Estonian workers pay to private pension funds also need to be reduced. Greater efforts should be made to improve women’s position at the workplace. Providing incentives to share childcare responsibilities more equally between men and women, and overcoming remaining shortfalls in the supply of childcare facilities, would help bridge the yawning gender pay gap.